The one where: A pair of angels move to York and set up a legal practice to help humans in trouble. Their first case sees them try and prove the innocence of a man accused of shooting his ex-girlfriend on her wedding day. Verdict: ITV1 hasn’t had a lot of luck with genre TV. With TV commissioning seeming more than ever to be a case of “pick this successful thing and make something similar”, you’d imagine ITV bods would be keen to get some of the commercial success of Doctor Who or Being Human or, even, Torchwood (although they’re probably still laughing in relief at having nothing to do with the shambles that was Miracle Day ). Demons was woeful, while the closest to a success they’ve managed, Primeval , was mistreated until a coalition of backers including satellite channel Watch stumped up the cash to keep it running. Safe to say ITV1 is not the first place you’d expect Life On Mars / Ashes To Ashes co-creators Matthew Graham and Ashley Pharoah to pop up with their latest show exploring the nature of the afterlife. But anyone expecting a similarly subtle approach to its fantasy elements from the writers might be surprised at quite how on-the-nose the show treats its subject matter. This show has angels. They have wings. Deal with it. The show isn’t for that Mars / Ashes audience, it seems, but aimed at a different target. There’s enough of the familiar fluffy procedural about Eternal Law to make it okay for the post- Coronation Street viewers. It’s not quite Doc Martin , but the gentle humour and showcasing of York that would make the city’s tourism board weep with joy gives it a soft sensibility that makes it very watchable if you watch it with you brain not so much in neutral, as not even kicked into ignition yet. It’s fluff, yes, but a fun way to spend an hour if you can get past some of the more preposterous elements of the plot. And there are are a lot of them. Tom (Ukweli Roach) and Zac (Samuel West) are angels, sent from heaven with housekeeper /PA/exposition lady Mrs Sheringham (Orla Brady) to form the unsubtly-named Jerusalem Chambers, a legal practice in York aimed at helping the helpless while adhering to their celestial Prime Directive – not intervening directly and removing humans’ free will. Think the anti-Wolfram and Hart, with cobbled streets and snickleways. Funnily enough, the other side of the courtroom is also occupied by an angel, albeit a fallen one, putting York straight in high on the list of the UK’s most supernatural cities alongside Bristol, Cardiff and Barry. Tobias Menzies as Richard gets some of the best lines and steals scenes from the rest of the cast in the way only a good baddie can. The premise is intriguing (although there’s a fine line between “original” and “bonkers” which, for now, the writers are sticking the right side of), and there are some interesting moments and an intriguing wider debate about whether humans are worth the angels’ effort in saving or not. Tom’s excitement at being amongst humanity is infectious and a great foil to Zac’s jadedness, although the introduction of Zac’s lost love (within minutes of the inevitable pronouncement that angels aren’t allowed to love because it makes them weak) was uncomfortably cheesy even before his Anakin Skywalker style ‘Nooooooooooooooooo’ and Hulking-out in angel style (the wings looked terrible) in her hospital room when she took a turn for the worse, which was hide-behind-a-cushion cringe-making. There are also a number of those annoying moments where the writing falls into the, “Oh, it’s fantasy so we don’t have to make sense” trap. After Tom slaps his had over the female witness in the street, how come she doesn’t go straight to the police to report she’s been assaulted by the defence team ? How come Zac can fondle someone on a bus without being noticed by the other passengers? Why has Tom so little idea of his mission? (So that the plot elements an be explained to the audience, clearly, but some of his lack of knowledge about what he’s let himself in for seems downright daft.) Some of these moments of weakness can be put down to a director who doesn’t seem at home in the genre and can’t quite balance the tone. Shergold also seems to have a lax attitude towards extras: after the shooting scene they all stand up and look round quizzically as if waiting for someone to tell them what to do. Overall Eternal Law was more watchable than Demons , but the case-of-the-week structure and Boston-Legal -with-wings vibe could get old quickly, despite the humour and some good performances. It’s walking a fine line between cheesy and whimscial, and its success may depend on which side of the line it settles in future episodes. Definitely worth giving episode two a go, but it’s not a must-watch yet. 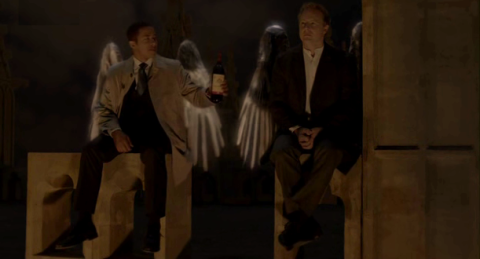 Falling angels: Zac and Tom spend a great part of the episode drinking – they manage wine, brandy, pints of beer, and then head to the roof of the cathedral for one last drink and an admittedly iconic final shot of them, wings on, toasting their new life. Legal insight of the week: “Diminished responsibility? Are you sure?” “You saw him, he just headbutted a table.” – Zac explains exactly how they’ll be defending their client against the charges of attempted murder.